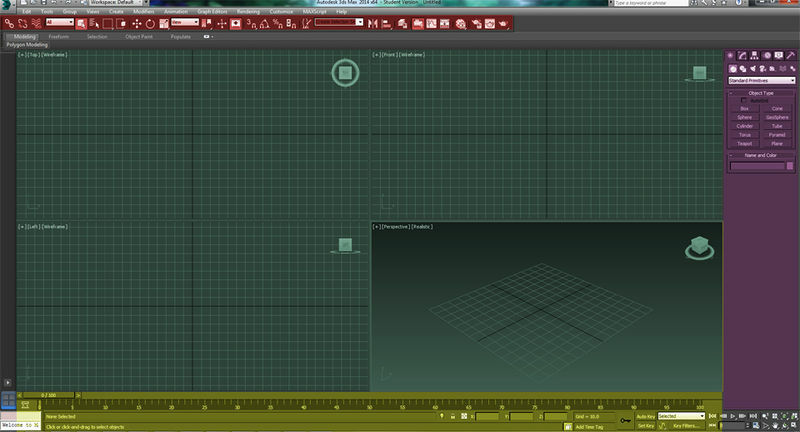 This page has been requested to be moved to tutorial:modeling in 3ds max. 3.5 Chapter 2.5: WHY CAN'T I SELECT ANYTHING! By Bilsta1000. 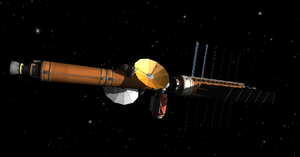 This tutorial will cover creating the geometry, texture and animation for a MIR Docking Port. 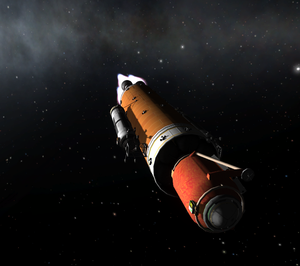 It will also include getting your model into KSP using unity and how to set up your collision meshes correctly. A bit of background to me: I’m a final year university student who has been using Max, Maya and various other pieces of 3d modelling software on and off for several years. Having been taught myself and also being taught by professionals and amateurs alike, I know how intimidating and confusing some pieces of software can be to work with. meanwhile advanced modellers can click straight through to helpful sections such as setting up Max for KSP. Please don’t follow this tutorial to the dot; I’ve intentionally left out steps to make sure that following my every single mouse click is very difficult. 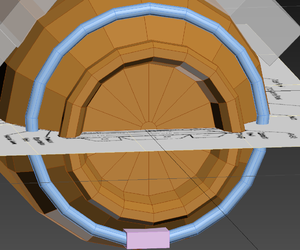 This way, rather than learning to model a MIR Docking Port, you’ll learn to create whatever it is you’d like to create. If you’re a student then you can download free versions and get free licences for Max, Maya and any of the Autodesk suite. All you have to do is register at http://students.autodesk.com/ and scan or take a photo of your student card. Max can be very intimidating on first launch, especially if you've never used it before. So first we will get used to where everything is. 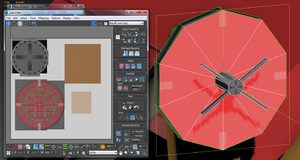 First you have your viewports (green) where your model will sit whilst you edit it. Any of the views can be edited if for example you'd like a textured view in one and a flat wireframe in another. It's your Max, Have it your way. By default navigating this view is done with the mouse, here are some very useful notes on navigation alone. Selection filter - when selecting an object, you can only select what's in this box. 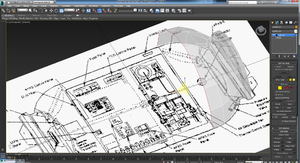 Select by name - Opens a window where you can select an object by name, Useful if you have a lot of parts to your model. Selection region (hold) - With this you can change how you click and drag to select objects. If set to Crossing, whilst clicking and dragging, if any part of the geometry is dragged over it will be included in the selection. If set to Window, whilst clicking and dragging, the entire part needs to be inside the bounding box for it to be included in the selection. Reference coordinate system - This changes the orientation of your transform gizmo for when you manipulate your objects. View - The default, The gizmo will be parallel with the viewports grid. World - Usually the same as the viewport unless you have changed the orientation of your grid. Grid - The gizmo will be parallel with the grid. Change pivot point - This has quick options to move your pivot point around, Bear in mind you can move your pivot point anywhere you want by using the Hierarchy panel. Use Bounding Box Center - This moves your pivot point to the center of the bounding box. These are most of the tools you'll need, I find it easier to relax my left hand on the W + E + R keys which then makes "Move" my ring finger, "Rotate" my middle and "Scale" my index. Usually found on the right hand side of the screen, the panels window (Purple) is used for any creation or editing to your model. Modify - Modify something in your scene. Motion - Used for Mocap and controlled animation. Display - Used to show and hide parts of your scene. Utilities - Helpful little scripts. I will go into more detail into certain sections of this as and when we need them as there is way too much to cover. This will be covered in the animation section, for basic modelling you don't need this. Chapter 2.5: WHY CAN'T I SELECT ANYTHING! You have object select locked…. Press [Spacebar]. In Wireframe view, You're attempting to select the object itself rather than the wireframe. You’re making a crossing selection when your [Window/Crossing] toggle is set to window. See the section above on toolbars. When modelling a part, the most important step is to have some sort of reference material. This can be anything you can get your hands on whether it be three-views, images, videos, whatever, just have a lot of it. I usually dedicate a folder to the object in question and put all of the photos in there, then I can just flick through when I need to know something. 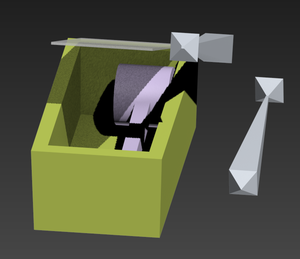 For this tutorial I will be modelling the MIR Docking port as it's a pretty basic model to start with. I've found some photos and they're all ready to be flicked through when I need to know something. I've found a blueprint kind of view which will come in very handy when it comes to modelling. Images can give you overall ideas of how the texture and geometry all fits together. Firstly we need to make sure that the Max units are equal to 1 Unit = 1 Meter. This is done by going to [Customise] --> [Units Setup]. I'm setting my unit scale to Metric and in [System Unit Setup] I actually set how much one unit is equal to. I will probably only need a side view for now to get the basic shape and then later when it comes to detailing I'll use the rest of the research. I create a plane by going to the [CREATE] Panel and selecting [Plane], I then click and drag on the grid to create it. 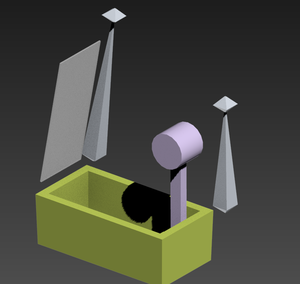 This will have the side view image so I can model off it easier. To then add the image I need to give this plane a material; I go to [Rendering] --> [Material Editor] --> [Compact Material Editor]. Once the Material editor has opened I find the Diffuse colour which is a basic object texture. Next to diffuse there is a gray box (by default) this is the colour of that particular material. Next to that gray box is another darker gray box which is for your maps. For this we will use a BITMAP so I click on the gray box next to the lighter gray box and then select [BITMAP]. This then opens my file explorer, I find the image and it is applied to the material. Now we need to assign that material to our geometry; I click and drag the material from the material editor onto my plane. 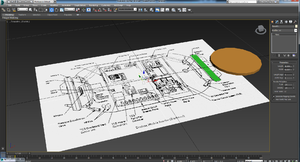 By default the image will not be displayed on the geometry, You have to click on your viewport render style which is next to the viewport name (Left, Top, Perspective), go down to [Materials] and click either [Shaded materials with maps] or [Realistic materials with maps] depending on whether you want it quickly rendered in your viewport (shaded) or realistically rendered in the viewport. If you experience lag, this is the first thing to change. 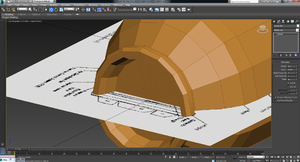 Once there's a nice reference in our viewport we can make sure it's scaled right. If you have access to technical details this can aid you quite a bit but bear in mind you need to scale relative so that the object is then useful in KSP. 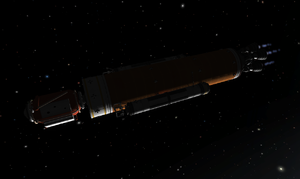 For example this Docking Module is 2.6M diameter x 4.7M length so these wouldn't be very useful if you tried to dock to it with the stock parts. This module will be designed to fit on 2m radial pieces so firstly I created a cuboid that is 4m length, (remember radius is only the size to the center) and lined my plain up with it to make sure that the scale was correct. Firstly I created a 2m cylinder since this is the sort of shape the end result kind of looks like. I positioned it over the part where the docking port will be and rotated it so this will definitely fit on a 2m part. I delete the two ends so that I have a hollow cylinder and I work from that. At the bottom there is three numbers labeled X Y Z, these are absolute values hence if you set a parameter to 0 then we know it's centered as I have with the Z and Y axis. 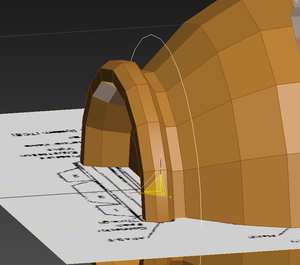 Once it's all centered I add an [Edit Poly] modifier by clicking on the [MODIFIER LIST] on the right hand side. This means that we can now edit the subgeometry (Vertices, edges and faces). A good shortcut key at this point is [ALT] + [X] this will make the piece of geometry selected transparent so you can work on it easier. Once I've reached the end, I pull the geometry all the way in and apply a [CAP ENDS] Modifier to seal it closed, There are other ways to do this but I find a cap ends modifier is the easiest and best way. So now that our main shell is complete. 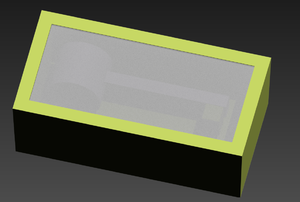 I start to model the two solar arrays. Because there's no end view of these I'll have to just match the reference images. Spline modelling is the name given to modelling from a single drawn line. I make an accurate guess on what the end of the end looks like and I draw it out using the [Shapes] submenu under the [Create] tab. Notice I do this as a separate shape far away from the rest of the model. We will construct everything together later on. When creating your line, If you use the [Shift] key, it will keep your lines straight when working from the Top or Side view. Once the end shape is complete, I then add an [Extrude] modifier which turns the line into geometry. I use reference imagery to get the scale about right. Granted at the moment it is huge compared to the rest of the model but this doesn’t matter. I scale it down and see how it looks next to the rest of the model. 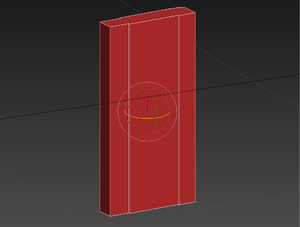 One thing you’ll find when extruding a model like this is that the pivot point will be incorrect. This can be fixed by going to the [Hierarchy] tab, clicking [Affect Pivot Only] and then clicking [Center on Object]. Be sure to deselect the [Affect Pivot Only] after you’ve centered it, otherwise when you try and move or rotate your object, you’ll only be moving or rotating the pivot point. I used spline modelling again to create the second array. So now we have the basic geometry we need to be detailed. Detailing is what makes an object look better. You have to base how much detail you can afford to do on your tricount. You can view your Tricount by clicking the [+] next to the viewport name and opening the [Configure Viewports] window. In here under the [Statistics] tab, click [Show statistics in Active View] and your TriCount will be displayed. Currently I have 1,140 so I'm ok for now and will aim for a final tricount of about 2000 Tris. Once this is done, [Create] a small cylinder, delete all [Faces] apart from the circle ends and line it up with the beginning of your spline. One thing I have found with this method is that it seems to struggle doing entire circles and it can also increase your tricount dramatically. Optimising your model is good practice when modelling for game engines, it means that the Game Engine doesn't have to work too hard when it wants to load your model. The texture file I used for pipes etc. Texturing is adding the colours and 2d detail to the geometry. 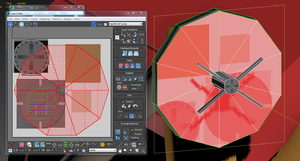 ONCE YOU'VE ADDED THE UNWRAP MODIFIER, ANY ALTERATION TO GEOMETRY WILL MEAN YOU HAVE TO START AGAIN WITH UVW MAPPING. Firstly you have to decide which parts of your model will reuse specific textures. 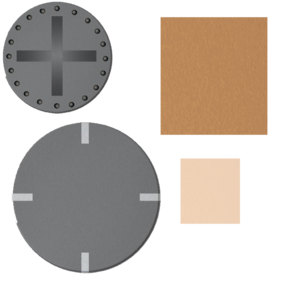 In my example I've split it up into two different texture files. One will contain all of the textures for any piping and the other will be for the solar arrays and the module itself. This section is difficult to explain as each model will be different and different programs will create different qualities of texture, If you're unsure on creating the texture yourself ask someone to help you as you do have to have a skill at digital art sometimes. In the pipes texture it contains the texture used for the external docking target which is simply four rectangles with a bit of noise on them since metal isn't flawless. To then assign the texture I need to import my texture; I go to [Rendering] --> [Material Editor] --> [Compact Material Editor]. Once the Material editor has opened I find the Diffuse colour which is a basic object texture. Next to diffuse there is a gray box (by default) this is the colour of that particular material. Next to that gray box is another darker gray box which is for your maps. For this we will use a [BITMAP] so I click on the gray box next to the lighter gray box and then select [BITMAP]. This then opens my file explorer, I find the image and it is applied to the material. Now we need to assign that material to our geometry; I click and drag the material from the material editor onto the parts that will use that particular texture. 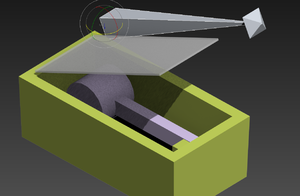 Select the object you wish to texture and apply a [Unwrap UVW] Modifier to it. The idea now is to select which part of the texture goes to which side of your models. If you cannot see your texture in the UVW editor, you need to make sure it's assigned to the part you're working on. Once it's assigned, to make sure you can see it in the UVW Editor there's a dropdown menu in the top right of the UV Editor where you can change the background of the UV Editor to your texture. 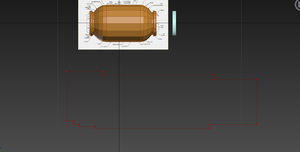 You can separate them from the rest of the model by clicking one of the flattening options under the [Explode] panel. Just click each option until you find which one works best, for example one splits them up into each individual polygon, another separates them but keeps them attached. Once it's separate, you then simply move, scale and rotate it until it's covering the correct part of your texture. Yes it really is that easy to texture. The model that I decided to create unfortunately doesn't require any animation so for this section of the tutorial I will give the very basics by doing an opening gear door. Firstly for any animation you need to decide on the order of events for any animation and how long each part will take. In my example it will go as follows. Now all animation is done with bones, This has the advantage of being able to use the same piece of software but stops any accidental damage to the model, which in some cases will have been worked on by another person. The easiest way to get your head around bones is to think of them as hinges. For ease, I will be working on mine upside down. I start off by entering the [Systems] tab of the [CREATE] tab in the [MODIFIERS] stack. I select [BONES], To start the bone you click once, you don't click and drag for this. I click where the hinge would be and then extend the bone over the geometry in question. I then click once more and right click to finish. You always want the extra little nub as this is useful for moving the bone. 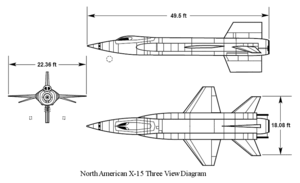 Note that you have to be in an orthographic view (Top, left, bottom etc.) to create bones. Notice that the bone doesn't have to be on top of the geometry. I usually offset the bones to make it a bit easier when I'm working on one axis. Once you've positioned your bone correctly you can then parent the object in question to it. In the toolbar at the furthest left, there's a button labelled [Select and Link] click this and then click and drag from your geometry to the control bone. 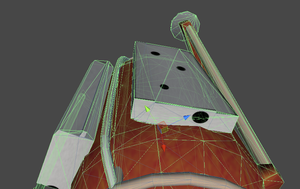 Now moving the bone controls the geometry. Keyframe animation works by the animator setting how the geometry should look on specific frames and letting the computer work out the bits in between. To start I set my initial state. This is the state that the scene starts at so in my case it's door closed, gear up. I select my bones and click [Set Key] on the timeline at the bottom. A red border will appear on your screen. If you're on the default, your timeline might not go up to the number of frames you need. In this case click [Time Configuration] on the timeline and change the [End Time] to the total number of frames you'll need. To set a key you can either press the [K] key, or click the key next to the [Set Key] button on the timeline. Remember that setting a key will only effect the objects selected and any that are parented to it. I then set up the new state, make sure the bones are selected and press [K] again. I continue like this until my animation is how I like it. 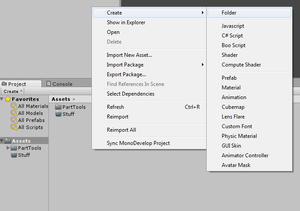 Once you've downloaded Unity and the Part tools you'll need to install them. 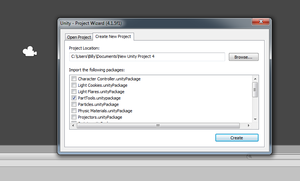 Unity has a GUI installer so that should be easy enough. Out of Max you want to export as a .Dae Make sure that the scale factor under the [Units] section is equal to 1.0 Other tutorials talk about the [Unit Conversion] tab, Personally I've never had any issues with [Y-Up] Export it and then you can then drag this file to your asset bin in unity. Once in unity, then drag it into your game object. Assign any materials by first importing them to unity and then dragging them to the correct objects. Make sure everything looks ok before moving onto meshes. For your mesh coliders, this is where splitting up your model will come in exceptionally handy otherwise you may have to go back and do it again. Once it's been added it will appear on the right hand side of Unity. Make sure that Convex is selected and have a look at the green lines that have appeared on your mesh, these should line up with the geometry as best as possible. If they don't then you need to break up your model further. Do this for all of your parts. I opted to leave out the two rings so these will not have any kind of collision since it's designed for the stock 2M docking ports to fit nicely inside it. Once you've done everything above, you're ready to hand over your part to the kerbals to have their fun with it. Now you will have a folder with a model file named whatever_you_named_your_model.mu, plus a couple of textures. These are all ready to go into Kerbal Space Program so create a new folder in Kerbal Space Program\GameData\ with your name and inside that folder create another with the name Parts and a third with your part's name. You're all set bar one last thing. This will be an absolute BASIC .cfg File since I'm a modeller not a programmer. CFG files are all different and they require their own tutorial so one will not be provided here..... mainly because I'm no good at creating them. Be sure to test your part out before any kind of release, the [Alt] + [F12] menu is very helpful in this situation. I hope you enjoyed this tutorial, any questions feel free to PM Bilsta1000 and I'll try and answer as best i can. Once the model is finished we need to make sure it's working fine. I built a quick rocket to get it to my thrown together space station and make sure all docking is fine. This page was last edited on 17 March 2017, at 18:30.